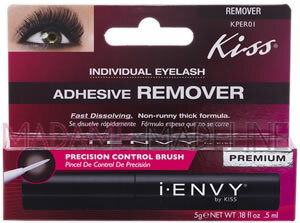 Kiss I-Envy Individual Eyelash Adhesive Remover (KPER01) will quickly remove the adhesive with find-tip brush. Remover specially formulated to easily dissolve individual lash adhesive. 1. Using tweezers, gently remove individual lash cluster from tray. 2. Dip end of lash cluster from tray. 3. From the outer corner, place lash cluster on lash line. Hold, allowing adhesive to dry. Gradually work toward the other corner until lashes blend. Using lash adhesive remover or baby oil, moisten cotton swabs and gently massage over lashes.